Because Santorini is such a popular destination (including with cruise ships), however, I was a bit apprehensive about visiting. I wanted so badly to see all those windmills and churches and beaches — but I didn't relish in the thought of competing with hordes of other tourists in order to do so. Thankfully, Santorini did not disappoint. It is just as stunningly beautiful as the photos and postcards lead you to believe — and you can easily avoid the cruise ship crowds if you time things right. Santorini's official name is actually Thira. The island sits in the water-filled caldera of a massive volcano that is thought to have ended Minoan civilization on Crete. Due to its volcanic past, Santorini has white, black, AND red beaches. Despite a harsh, dry climate, Santorini has a flourishing wine industry. 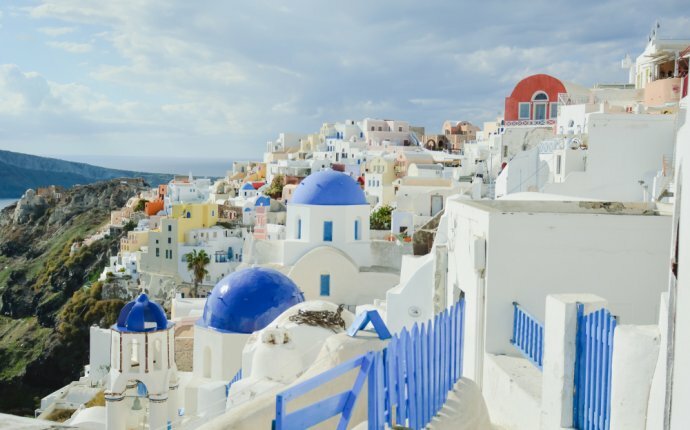 Fira is the capital and main city on Santorini. It is where most of the cruise ships dock, and also where the ferries arrive/depart. It has a host of accommodation options, and also some of the best shopping on the island. Especially if you're looking for souvenirs, jewelry, or artwork, the narrow streets on the cliffs of Fira are where you want to be.